The time has finally come! 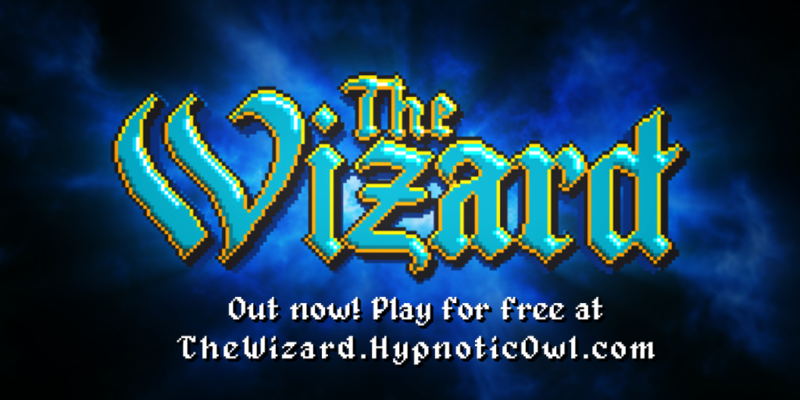 Today we release our turn-based dungeon-puzzler The Wizard! For free! We look at The Wizard as an opportunity to share our lighter side with you and to experiment with various ideas and approaches to developing and releasing a game, and we just don’t wanna charge you for that right now. If you happen to like what we do and would like to support us, that’s awesome! You can donate whatever amount you see fit over on The Wizard’s page. It’s basically Pay What You Want, you can play for free or help us out, whatever you feel like. Rest assured, you’ll have our undying gratitude either way. Oh, but that’s not all! 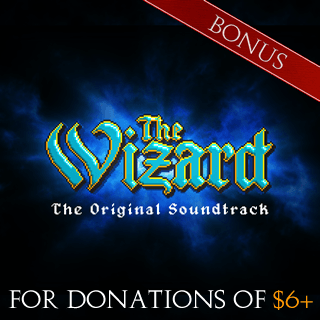 As a special thanks to those particularly generous, donations of $6 or more will get a digital copy of the magical The Wizard soundtrack! But enough of that, it’s time for you to go and play The Wizard now! Hope you have fun! ps. For those in the business of hosting high-quality, mobile-ready HTML5 games, we’ve got good news for you, too! From today on, non-exclusive licenses for The Wizard will be available in the FGL Game Shop. You don’t even have to use FGL if you don’t want to. Just send me a mail! This entry was posted in General, News on Wednesday July 23rd, 2014 by hackenstein. Welcome back to our post-mortem series for The Wizard! Should you have missed the previous parts, you can read about the birth of the wizard, designing the walking, and spellcasting here. For everyone else: Let’s talk level design! This entry was posted in Behind the Owl, Post-mortem on Tuesday July 22nd, 2014 by hackenstein. Welcome to the second part of my design ramblings, which also happens to be the third part of The Wizard’s post-mortem. Should you have missed the first two parts, you can check them out here and here. Now that we know how both wizard and player learned to walk, it’s time we take a detailed look at the spellcasting system, which is probably the most unique feature of The Wizard. Again, and even more so than last time, my incompetence as a programmer played a fairly big role in its creation. Cluelessness really is the mother of invention. Or something like that. Now, the easiest way to add spellcasting to your game is via an action bar. I guess you could call it the “traditional” approach. This wouldn’t have been too hard to implement either, but two things bothered me about this: First off, I find action bars kinda ugly. An action bar drawn by me? Even worse. And thanks to Oryx’ sprites everything was already looking surprisingly good, so I was not willing to deface it by tacking an action bar on top, even if it was just an experiment. Secondly, clicking on icons to cast spells isn’t very wizardly. In fact, I think this is the reason why I usually don’t play mage classes in games. Magic is supposed to be a mysterious, arcane art. You can’t achieve this with a profane action bar. This entry was posted in Behind the Owl, Post-mortem on Thursday July 17th, 2014 by hackenstein. Last time we left off with the wizard standing in a sewer level with lots of rats but no ability to walk, cast spells, or do anything else, really. And with me not being much of a programmer of course. Funnily enough, that one had a big impact on some of the most important design decisions. This entry was posted in Behind the Owl, Post-mortem on Monday July 14th, 2014 by hackenstein. This is the first of a series of posts about the conception, development, release, and monetization of The Wizard, our first attempt at making money with games. The Wizard started out as a small experiment I worked on to learn the Phaser HTML5 framework. Back then, Crabman and I had just decided to take a break from our work on Till Last Light after realizing that we wouldn’t be able to afford the graphics we had in mind. Obviously we needed a smaller project for our humble beginnings. So we came up with a plan: We’d each create a small prototype in four weeks’ time and then we’d choose one of them as our new project. The next step was to get some graphic assets. I wasn’t sure what kind of game I wanted to make yet, but I had been in love with Oryx’ sprites ever since I played Dungeons of Fayte. This was the perfect opportunity to make a game with his 16-bit fantasy sprite sheet. Convincing Crabman that we absolutely had to buy the sprites was easy enough, now I just had to figure out what to do with them. My first idea was a group-based RPG about monster game keepers. They would get called by villagers every time a monster population grew too large and threatened the ecosystem. So, nothing fancy, just a few different classes, a dozen monsters, a bunch of items, various NPCs with individual quests and an open game world. It didn’t take me long to realize that this idea was getting too big already. To keep things simple I decided to start as small as possible: A single character in a small level with just one enemy type. 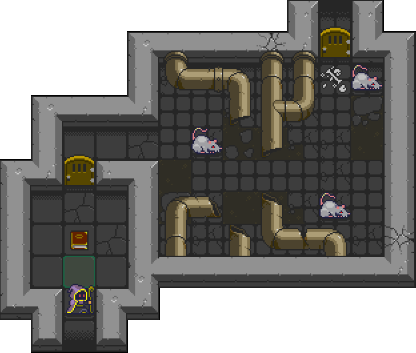 Using the 16-bit fantasy tiles and the Tiled Editor, I created a small sewer level. Choosing the enemy was a no-brainer: It had to be rats, the traditional first enemy type, which meant only the player character was missing. I was staring at the sprite sheet, contemplating on what character to use and listening to my fantasy playlist to get in the mood. To be honest, I don’t remember if it was during “Wizard” by Uriah Heep, but I know it was on the playlist. 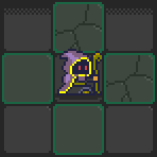 I’m usually not a fan of wizards in games – it’s mostly because the actual spell casting seldom feels right – but the sprite of the wizard intrigued me. Why didn’t he have a face? From a practical standpoint it also seemed like a good idea. A wizard didn’t need an item progression, implementing different spells would be enough. Thus The Wizard was born, or at least his first basic incarnation as a simple sprite inside of a small sewer section with a bunch of rats. Stay tuned for the next part in which we’ll find out how the wizard learned to walk, cast spells and who is responsible for his lack of a face! This entry was posted in Behind the Owl, Post-mortem on Monday July 7th, 2014 by hackenstein.